Forget clutching the latest It bag, if you want to get ahead of the pack this summer you need to sling a rucksack over your shoulders. It all started back in 2011 when Ashley Olsen was papped carrying a green alligator skin backpack in her oh-so-cool, yet casual manner. A quick google search later and, sadly, thousands of girls’ dreams were crushed when they saw the eye-wateringly expensive price tag of £22,950. From the Oslens’ own fashion line, The Row, many thought the twins were joking, but they soon had the last laugh when the backpack, which also came in black, sold out worldwide. 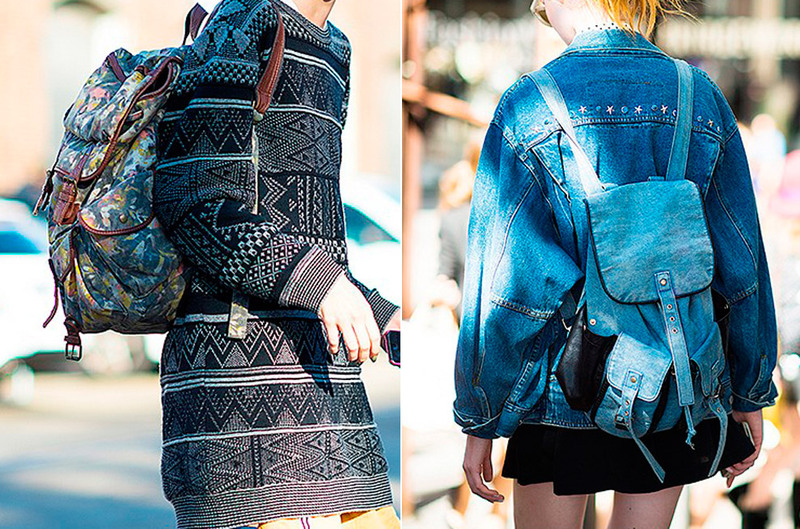 Soon more and more fashion girls were papped on street style blogs slouching around with retro backpacks emulating the pint-sized power twins. Of course, this trend all really goes back to 1985 when Miuccia Prada debuted her nylon rucksack, which soon became the key fashion item to have and to hold in the early nineties. Nowadays an original fetches over £500 on ebay. 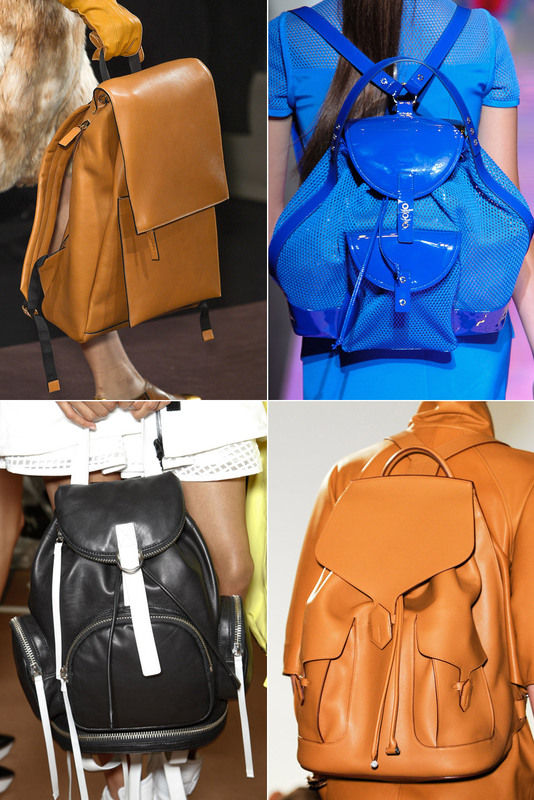 Since then backpacks have been popping up on runways including Marc Jacobs, Louis Vuitton and Missoni in Autumn/Winter 2010, Felder Felder and Alexander Wang in spring/summer 2012 and, most recently, for spring/summer 2013 at DKNY, Versus and Hermes. They also appeared at Marni and Miu Miu for Autumn/Winter 2013. So who is rocking them off the runway? Backstage at the shows this season all the models were lugging them around – think Cara Delevingne, Chloe Norgaard and Sam Rollinson. And a host of celebrities including Rita Ora, Willow Smith, Solange Knowles and Rihanna have all been papped sporting shoulder straps, plus Emma Roberts and Daisy Lowe have both been recently spotted with the Louis Vuitton Bosphore backpack. How can I wear this trend? Backpacks are obviously really practical but this doesn’t mean you should actually use them to their full advantage. Resist the temptation to chuck all your essentials in them. Just take what you can currently fit in your handbag and transfer it over. Whatever you do, do not over fill. They look best when they have their natural slouchy shape, not bursting at the seams, so leave the trainers and the large bottle of perfume at home. The look you want to channel is model off-duty not school girl or sightseer. 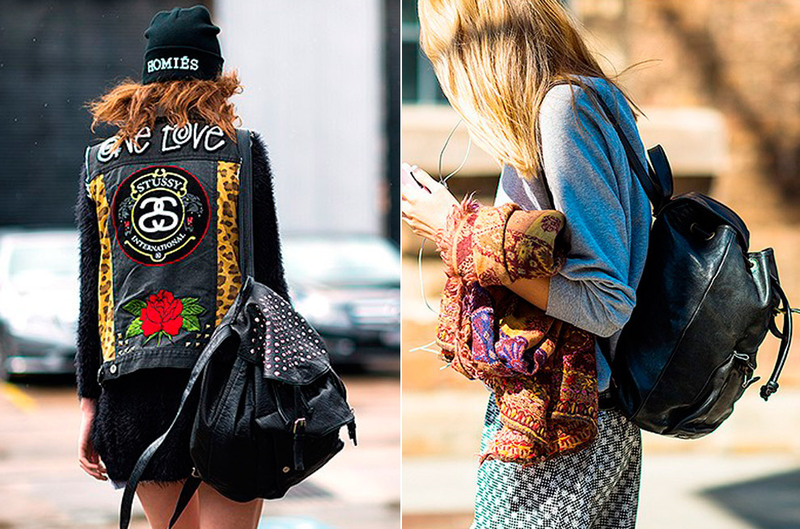 To keep it chic look for brass buckles and luxe leather. Plain tan leather looks great when paired with a simple white tee. Khaki is also a good hue for keeping a grown-up feel and as a key trend for AW/13 will ensure you gain extra style credentials. Sophia Webster, Pierre Hardy, Drifter and Topshop all have zingy colourful styles which are perfect for giving some extra zest to a plain ensemble and are sure to be the bag du jour at Secret Garden Party. Label lovers should be prepared to get in line on the 15 June when the Raf Simons and Eastpak collaboration goes on sale at oki-ni.com, Selfridges and stylecreep.com. The luxe satin backpacks come in limited edition colours: purple, navy, black/silver stripe and brown/navy stripe. Finally, positioning is really important. Adjust the straps of your backpack so it sits in the centre of your back. You want it to fall just below your waistline but no lower. Really, there’s nothing worse than seeing a low slung backpack bouncing around on a backside, no matter how firm it is! You have been warned.